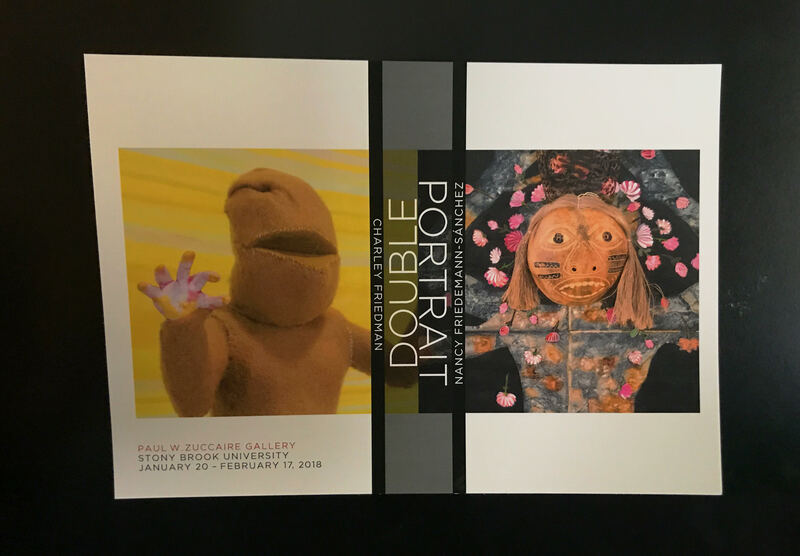 “Double Portrait,” a collection of sculptures and unusual drawings, is currently being displayed in the Paul W. Zuccaire Gallery at the Staller Center for the Arts until Feb. 17. The exhibit is the product of artist couple Charley Friedman and Nancy Friedemann-Sânchez, who use their sculptures and paintings to create a bizarre experience, employing abstract symbolism. “Garden,” Friedman’s large-scale wall installation, immediately grabs your attention. The installation consists of over 1,000 hollowed out eggs arranged in the shape of flowers, scaling the entire height and width of the wall. The unconventional medium plays well off of Friedmann-Sânchez’s “Cornucopia,” which depicts flowers emerging from a vase set in front of slithering snakes on sheets of black Tyvek. One of the best pieces on display is Friedmann-Sânchez’s “Self-Portrait with Papaya,” a collection of fruit-shaped wall lamps made from pearls. In “Self-Portrait with Papaya” the lamps – crafted with pearls perfectly strung together to create a smooth, organic shape – are set against a reflective black surface to reveal a self-portrait of each viewer. Another high point, Friedemann-Sânchez’s “Castas Paintings,” is stylistically similar to “Cornucopia.” The paintings – also on sheets of black Tyvek – consist of a series of multi-armed figures covered in fauna and flora. The faces of these figures are formed by reclaimed wooden masks. Through this unique combination of flat and raised material, Friedemann-Sânchez is able invoke a strong emotion and a sense of her Colombian heritage in the series, which is inspired by 18th-century Latin American paintings. One of Friedman’s more experimental pieces is a rotating mobile of inflated plastic balls similar to beach balls, titled “Science Project.” The mechanical sculpture creates an immersive experience as you feel the breeze generated by the rotations. Friedman’s “New Deal” depicts a swarm of wax squirrels in varying positions heading towards a lit doorway. The unexpected piece is a prime example of Friedman’s conceptual and often humorous work. “One-Hour Smile,” also created by Friedman, consists of three monitors showing Friedman holding a smile on his face for an hour, each filmed a decade apart. Each video shows its age by the quality of image and Friedman’s increasing wrinkles. While he should be applauded for undergoing such a strenuous test of endurance, his intention to unnerve the audience goes too far for my tastes. His broad smile stretches from one cheek to the other and his eyes give off a surprising air of animosity. As time goes on, the expression becomes more and more uncomfortable for Friedman and the viewer. Looking at it makes one feel as if they are being stared at by Hannibal Lecter, and after a few seconds it becomes unbearable to watch. Friedman and Friedmann-Sânchez have largely different styles and choices of medium, but the combination of the two show similarities in message. “Double Portrait” runs until Feb. 17 and can be viewed Tuesdays-Fridays 12-4 p.m. and Saturdays 7-9 p.m.